Well, today we head to Panama for a little time on the beach during Thanksgiving Weekend. I hope you all have a safe and amazing time no matter where you are going to be. I promised to put some pics up of my ESPN photo shoot I did last week, so here it is. I will give you a little sneak peek of the star of the show — my English bulldog, DH. I think they ended up taking more pictures of him than they did me! Well, I’m back in Chicago, and oh boy, it is freezing! But seriously, I think it’s awesome (at least for now). Miami was amazing. We got to see Pitbull, who put on a great show for all the Marlins fans. Wait until you all see the new uniforms in person before you judge them; if we start winning games everyone is going to love them even more! Being in Miami and seeing the new stadium, the culture and the energy that is already there and then seeing what the Marlins are trying to bring to South Florida shows you how serious they are. The front office, Mr. Jeffrey Loria and everyone else involved want to build a consistent winner down there. They are going to try and make the team better each and every year and that’s exactly what they are looking to do this year. As a fan, I think that’s all you can ask for. I will be here in Chicago until next week before heading down to Panama for Thanksgiving. We are going down to Panama to help out some people down there and be a part of Andruw Jones and Orlando Cepeda’s charity event. Derek Jeter and Jorge Posada will be down there, too, so it should be a great time. It’s always good to help out and lend a hand when you can. I hope I get to see my buddy Ruben Blades down there. I have never been to Panama, but I have heard great things so I’m excited to get down there. Please be sure to send along your questions through my site because I’m sure you want to know some of the things that have been going on, and I have plenty of time these days (haha). I swear I’m not going outside in this weather unless there is a Bulls game, and we know that’s not going to happen. My question for you is: What do you think about the Marlins’ new logo and uniforms? I think they look awesome! What’s up everyone?! Last night I attended the Marlins Community Foundation “Fish ‘N Chips” event and even though I got lost on my way over there (haha), I had a great time. What a great event and I am very happy that everything went so well. Tonight we get ready for the name change and the new uniforms that will be unveiled right next to our new stadium (hopefully I can figure out the Miami street system by then). Let me tell you something: Every time I see this new stadium it reminds me of when I was in Texas for the World Series and I got to see Cowboys Stadium. This place is going to be amazing, and I’m very excited to be a part of it. Got a chance to see a bunch of the guys and hang out and talk to them a little bit. For anyone wondering, I think this LoMo (Logan Morrison) kid might be crazier than me (haha). I know why so many people like him. So far I have heard the Marlins being linked to a lot of different players, and it seems like there is a little buzz already around this city. I know the Marlins and I are going to do everything possible to build a winner down here. I can’t tell you how excited I am to be a part of this process. It feels very good to be actively going out and being involved in trying to make this organization better, and I know we will get it done. So, tonight is a big night, as we become the Miami Marlins. Hope you all are excited to see the new logo and make sure you let me know what you think! Last, but certainly not least, I want to say thank you to all the veterans that have fought in the past and those that continue to serve and fight for this country. You are the real heroes and will never be forgotten. Back in Miami and excited for the new logo! I’m finally back in the United States, but don’t worry I had my iPad with me the entire time so I was able to see everything that has been going on. There are a lot of free agents out there and a couple of trades and signings already. All the news makes for a good read. It’s always fun to see how teams can re-tool and do the best they can to put a team together. I think as a manager — and as a fan — that’s fun to see. I’m in Miami right now. I need to start looking for a place down here; hopefully somewhere close to the ballpark. I will keep you guys posted on how it goes. I’m very excited for the new Marlins logo that we will all get to see on Friday. I have heard they have some awesome things planned so this week should be a lot of fun. I haven’t seen the logo, so I’m looking forward to it! I want to say a big thank you to the Pepsi crew and team in Venezuela for doing a great job working quickly on the new commercial we have coming out. 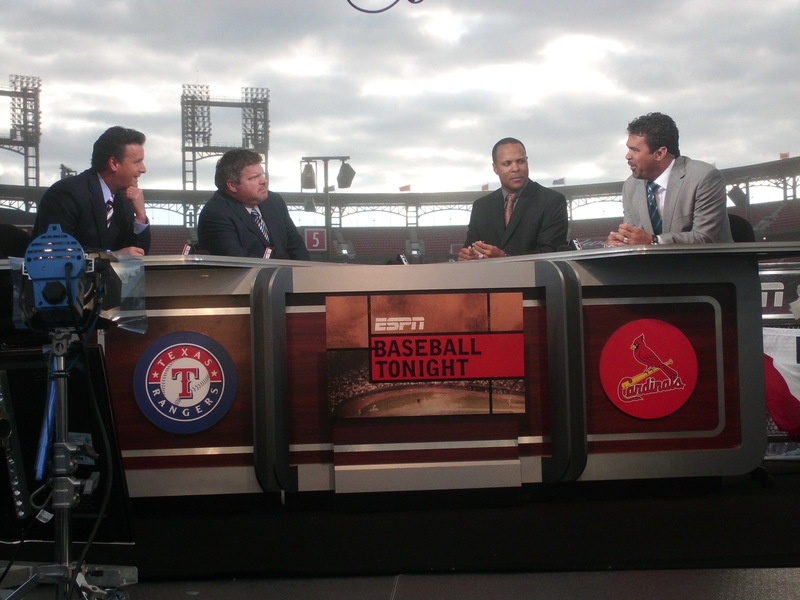 It was great working with everyone, especially Carlos Zambrano and Bobby Abreu. Personally, I’m just glad Bobby cut his toenails for the shoot so that nobody got hurt. Those things were deadly weapons a couple of years ago (hahaha). Seriously, what’s up with the NBA lockout? I was looking forward to seeing the Bulls this year. I’m headed back to Chicago soon and hope I can see some games this year. Figure it out! I will be watching Pacquiao vs. Marquez 3 this Saturday, as I would advise everyone to. It should be a good fight. OK, everyone, take care. I wish I could give you all a sneak peek of the new logo. Who knows? Maybe I will be able to. Hopefully we all look good in them, but I suspect that if we win we will look awesome no matter what we are wearing. My entire album from the World Series was just uploaded to my website. Check it out!